A Magento store for a leading comfort footwear retailer. Comfort & Fit is a leading provider of orthopaedic and comfort footwear, selling medical grade footwear through their own stores and via a large number of retailers Australia-wide. The company needed an online store to reach a broader customer base and to support their Podiatrist network, who are responsible for referring new customers into their stores. 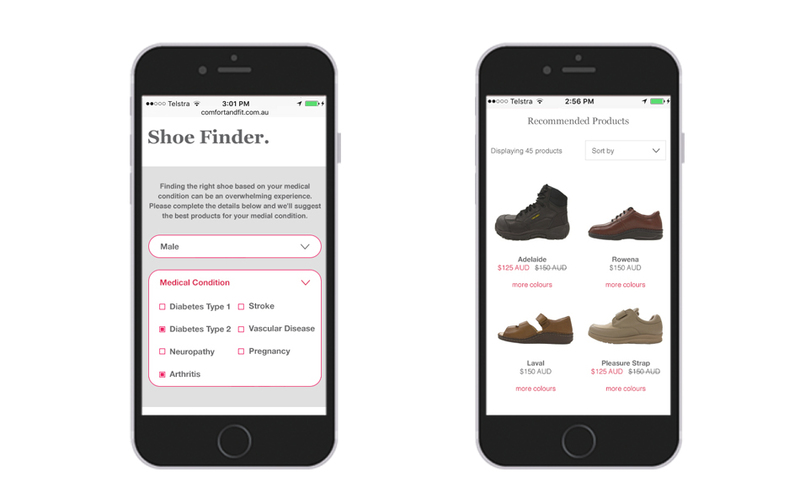 The online store was designed to guide customers to find the right shoe based on their medical condition, via the interactive Product Finder, exploring medical condition content in the blog or by filtering on brand and category listing pages. Custom functionality was also developed for Wholesalers to place orders on the website and for Podiatrists to refer customers into their closest Comfort & Fit store.